The Simonata is a must for its refined classic style. 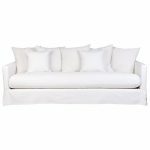 The design comprises clean lines and soft cushions in three beautiful fabrics. The Simonata is slip-covered for easy maintenance and cleaning. Available in grey, natural and blanc.